It’s here, it’s finally here! After over two years since Dawn of the Planet of the Apes, we finally have our first official look at War for the Planet of the Apes, the third entry into the hugely successful reboot/sequel franchise. Dawn ranked in at #3 on my 2014 favorites list, and for damn good reason, making my anticipation for War bigger than I ever imagined! And holy balls does it look like it’s going to live up to the hype. Matt Reeves returned to direct the third film after his tremendous work on Dawn, taking this modern day take of this franchise into a completely new and insanely exciting direction. When these new movies were announced, we were promised it would show the initial conflict between the two species and how Earth became a planet of Apes. Although it took three movies to get there, the wait sure as hell looks like it’s damn worth it! My opinion on this trailer is clear, obviously. But there is one, well really two things I can’t go without talking about. The footage was unbelievable, it knocked my expectations out of the water. But I don’t think I would have felt that way if the editing department didn’t perfectly place the two sets of voiceovers in the trailer. The two pieces of dialogue, one from Andy Serkis’ Caesar and the other from Woody Harrelson’s Colonel, take the footage to a completely different level. It gives you a totally different view and feeling towards what you’re watching. Trust me, watch the trailer again with the sound off and on. There’s no doubt we’re all pumped as f**k to see apes and humans face-off with horses and tanks and big guns and everything else, but the voiceover in the trailer clearly shows that this franchise is so much more than that. Unexpectedly, these movies have become a beautiful, can’t take my eyes off the screen character study of Caesar, a few of his fellow apes, and the handful of important human characters who have rotated through the three movies. 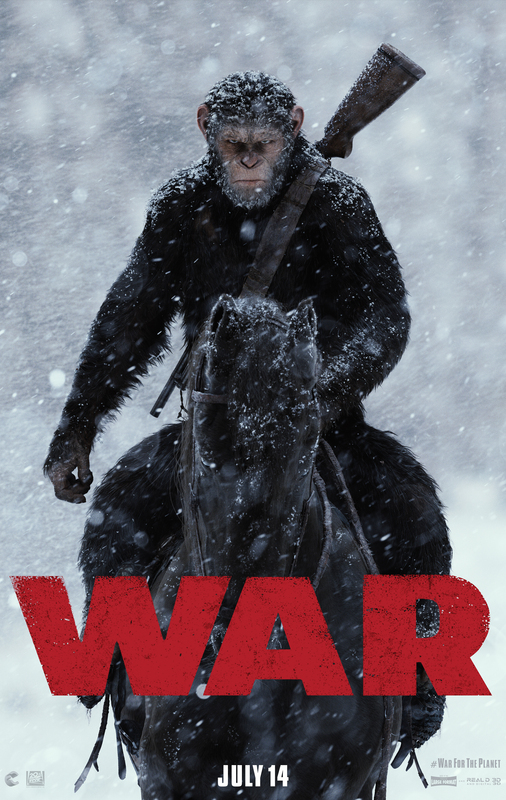 War looks like it will not only build upon everything we’ve come to know and learn about Caesar, but his family of apes and especially Harrelson’s war-driven Colonel. I can’t freaking wait. Take a look at the explosive new trailer below and please, please let me know your thoughts in the comments. Did you like Dawn? What did you think of the trailer? What kind of excitement/anticipation do you have for this film? Matt Reeves’ War for the Planet of the Apes swings into theaters on July 14th, 2017 and stars Andy Serkis, Woody Harrelson, Judy Greer, and Steve Zahn.